As always with a hurricane, the two questions are where and how bad. The where part has always been pretty straightforward with this storm. 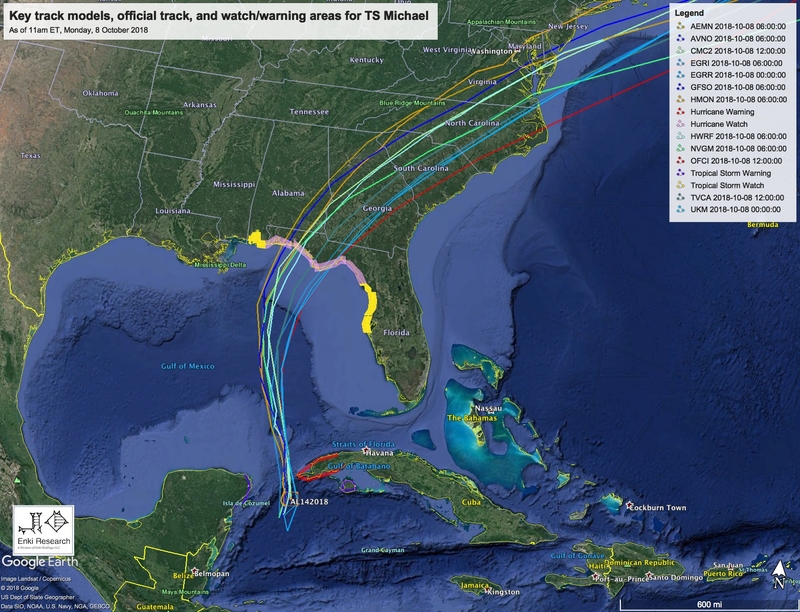 Here’s the major models (along with the watch and warning areas) – that’s a really tight grouping, and the meteorology on it is very straightforward that Michael will continue north, then start to turn northeast as it gets caught up in a frontal system that is presently over the southeast (the rain over Georgia yesterday and today is from that, not the Hurricane). The how bad part has changed from yesterday, maybe not as much as the hype of going from category 2 to category 4 might indicate although the dollar value did take a big jump. Yesterday morning the intensification had paused, and there was a descent chance it would stay at the high 2/low 3 range (that’s what I thought would happen), but outflow increased and shear decreased and the intensification picked up again. But it’s important to keep perspective, especially away from landfall. Right at landfall, yes, that 20 or 30mph wind increase makes a big difference. But that should be in an area where people have evacuated (anyone who stayed on the Florida coast in the warning area was unbelievably foolish). What you do for a Cat 3 and a Cat 4 are the same: get out. Dramatic Michael Update! (ok, that’s clickbait, nothing changed significantly since this morning but here’s some pretty pictures). The forecast from NHC at 11am really didn’t change significantly other than some tweaks in the track and intensity. Watch and warning areas didn’t change, Damage swath, damage estimate from my Haetta/TC model didn’t change much at all. Timing a little slower inland. 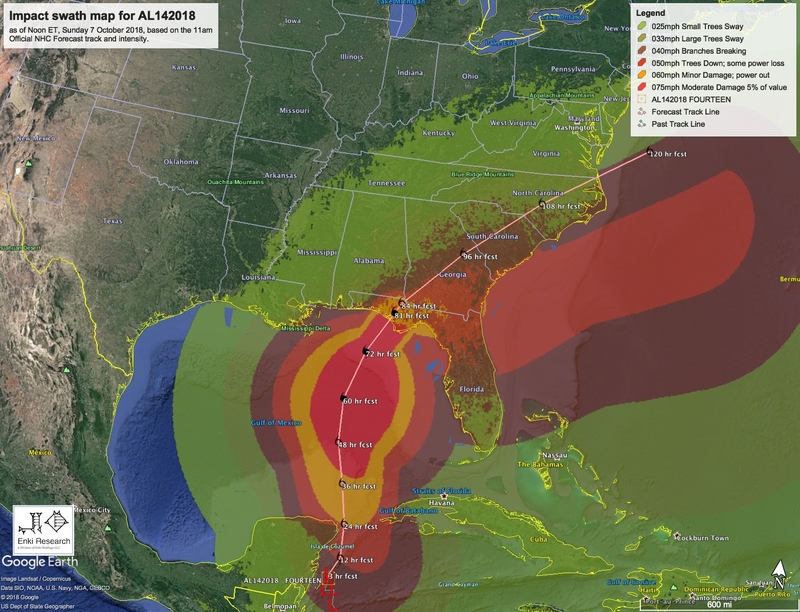 So, if you’re getting ready for a Cat 3 hurricane (and if you’re in the warning area, especially around Panama City, you’re an idiot if you aren’t), or in inland Georgia getting ready for some high winds and rain, keep doing that. See the earlier post for details. And here’s a visual band image of the storm. Got an eye, and may strengthen some more before landfall. 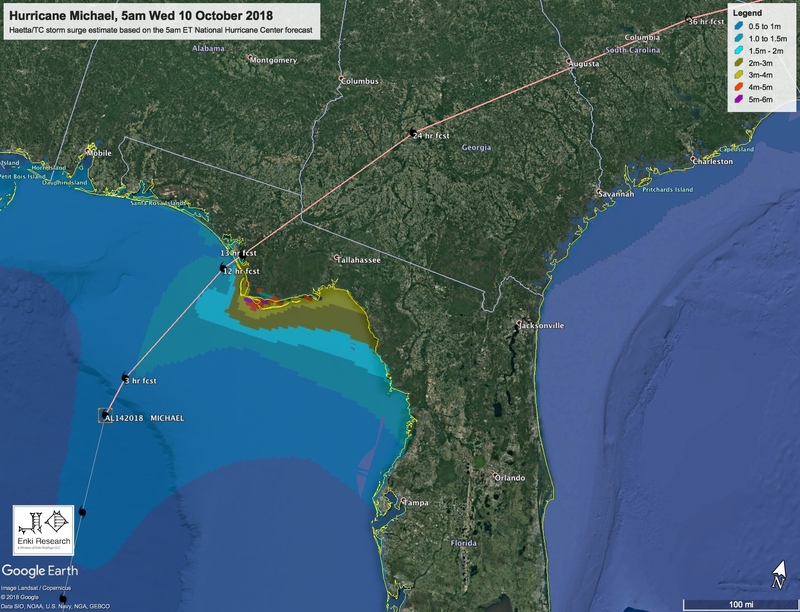 The potential impacts of Michael on Florida have become somewhat clearer now that the storm has entered the warm putrid waters of the Gulf of Mexico (sorry folks who live on the Gulf, as someone who lives on the Atlantic coast, it just smells funny to me). The short version is that while Michael is still “only” a Category 1 with 90mph winds, this is a potentially serious storm that could reach 120 mph or Category 3 strength before landfall. If you live in the Florida panhandle in the warning areas take immediate action to protect life and property! Intensity forecast is tricky. While there are conditions that are favorable for further strengthening, there are also some factors working against it. 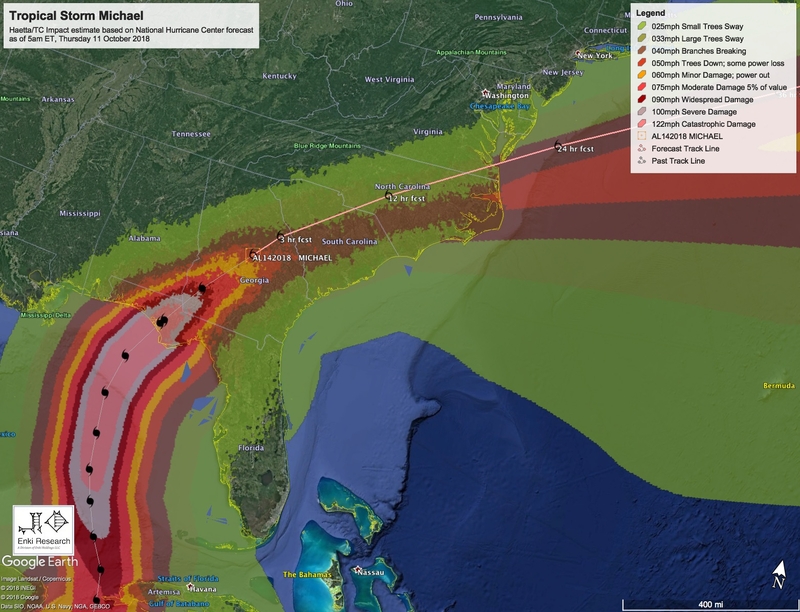 I’ve heard speculation saying Michael could reach Category 4 intensity (130mph), but I think that’s increasingly unlikely (in fact I doubt it will be much over 100mph at landfall). But for planning purposes people in the warning areas should plan on a Category 3 – if it’s not that strong, super, if more, it won’t likely be much more because NHC is pretty careful about underestimating landfall intensity. 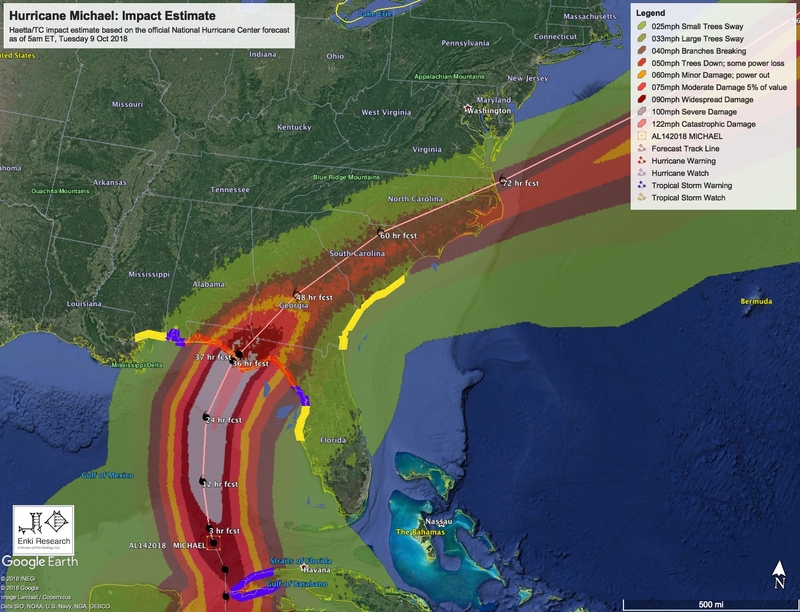 As for impacts, there are three areas to talk about: the 80 mile wide (30mi left, 50mi right) swath right around where the eyewall hits land, the Gulf Coast (especially the Big Bend area), and the inland and Atlantic coast. 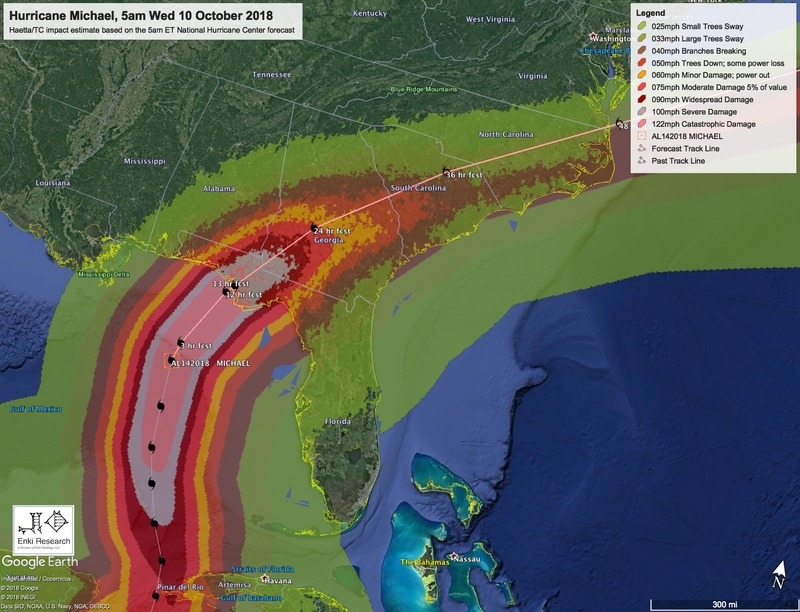 The landfall area will get hit pretty hard by “traditional” hurricane impacts – extreme winds, rain, waves, and storm surge. If Panama City takes a direct hit it will be ugly, current estimate is $7 to $10 Billion in damage. Of course, wobbles and things breaking that shouldn’t (or stuff not breaking that in theory should) matter for those kinds of estimates. As the storm decays inland trees down, flash flooding, power outages, that sort of thing begins to dominate. Another factor for storms like this are tornadoes – these tend to spawn more than a few. Michael won’t be a Florence/Harvey kind of storm where most of the damage is due to rain flooding after landfall, this is more of a “traditional” 24 hour hurricane event. But that still means flash flooding along the track. 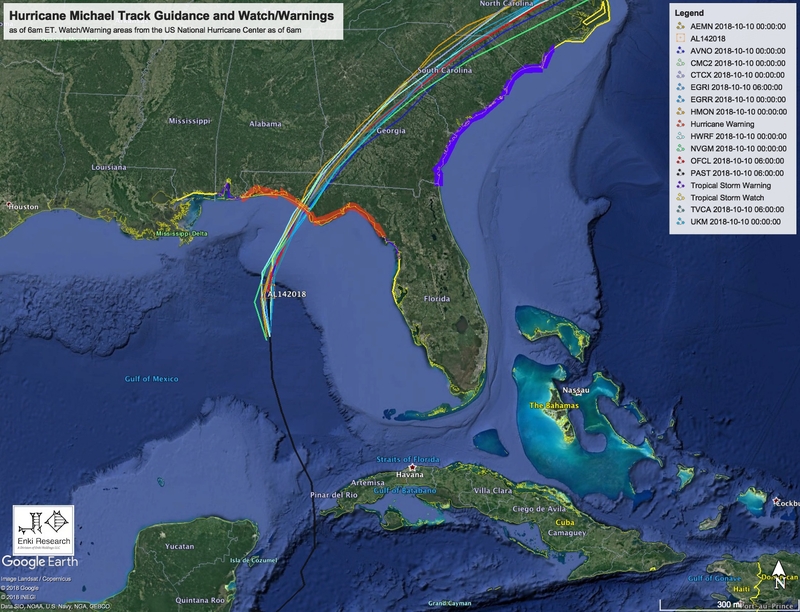 The second area to watch are areas south of Perry FL, in the “Big Bend” areal The geometry of the shoreline and strong onshore winds could create some pretty impressive storm surges even away from the usual place you worry about such things to the 80 miles or so to the right of the location of landfall. If you live in coastal areas prone to flooding, pay attention and take action. The third area to watch are places right on the coast of Georgia, SC, and NC. While they will see gusty winds and rain, places right on the shoreline are at risk of some flooding around high tide Wednesday Evening, and the two tides on Thursday. On the Georgia coast, high tides are already running a foot or so above normal because we are near the Fall Equinox, when the sun and moon are lined up and we have higher than average tides. Add a foot or two of water on top of that and it can cause problems in low lying areas. For example, in the Savannah area, using the Fort Pulaski tide gauge for reference, the average high tide is about 7.5 feet. The “no wind” forecast for the Thursday morning high tide (10:23am) is for about 8.4 feet. US 80 starts to flood around 9.4 feet, and parts of Tybee (14th street) flood at about 10 feet. So if Michael adds one to two feet to that tide, which seems reasonable at this point, US 80 will flood, and parts of Tybee may see some *shallow* flooding at the time of high tide. It won’t be dangerous unless you do something dumb, but will be hazardous and inconvenient. So you see local knowledge is key here – beware of getting tide gauge references and topographic map datums mixed up! Tide gauges are referenced to something called “Mean Lower Low Water” or MLLW because boats generally care more about not enough water (eg how low) than how high over fears of running aground. Topographic maps used to be referenced to mean sea level (MSL) – which on the GA coast is 3.5 feet *higher* than MLLW. But today topography is usually referenced to the WGS 84 datum, which is close to but not exactly MSL. I often see local TV weathercasters screw this up and scare the crap out of people because they mixed up MSL and MLLW. Your local NWS office (www.weather.gov, then click on your location) usually has information to sort all that out in their “Hurricane Local Statements” and other products. Here’s the Haetta/TC (my new impact model) estimated impacts, using the official NHC Forecast for the track and intensity of the storm. Other than gusty winds, for the Caribbean threat is mostly to the west end of Cuba as the storm makes its way out into the Gulf over the next day or so. The 11am NHC Advisory package for Tropical Depression 14, which will likely reach tropical storm status and be named Michael this evening, has landfall on the Gulf coast of Florida sometime Wednesday. 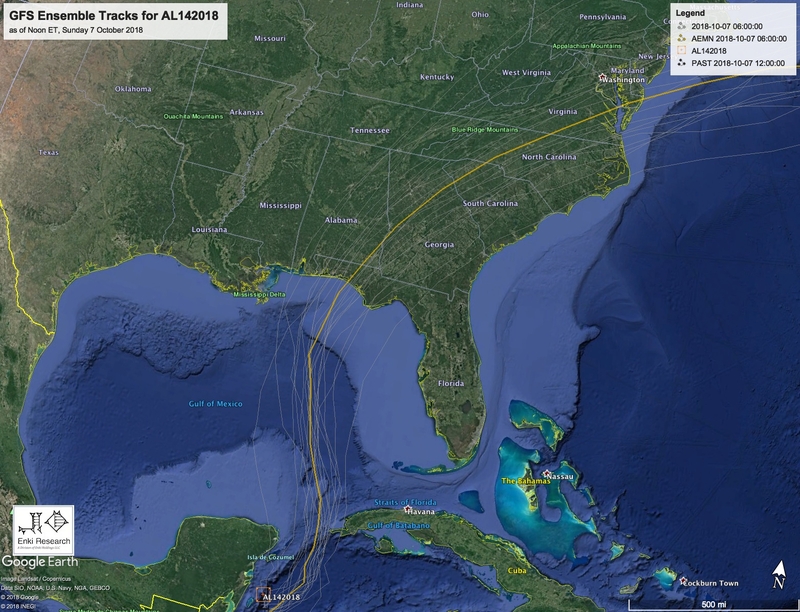 For those of you who just can’t live without your daily dose of pasta, here’s a look at some of the major forecast model track guidance guidance NHC was taking in to account in creating this forecast. 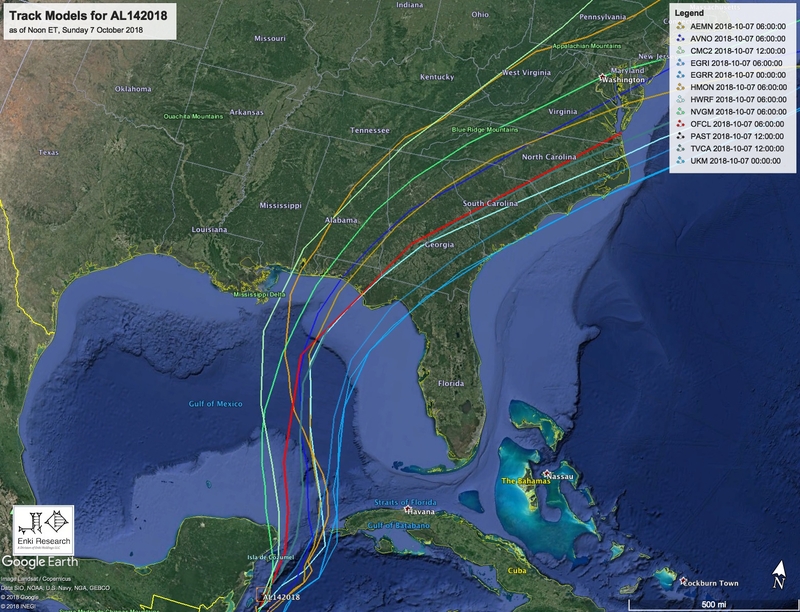 Some show landfall as far west as Mobile Alabama, some as far east as the “Big Bend” area of Florida, near Steinhatchee. 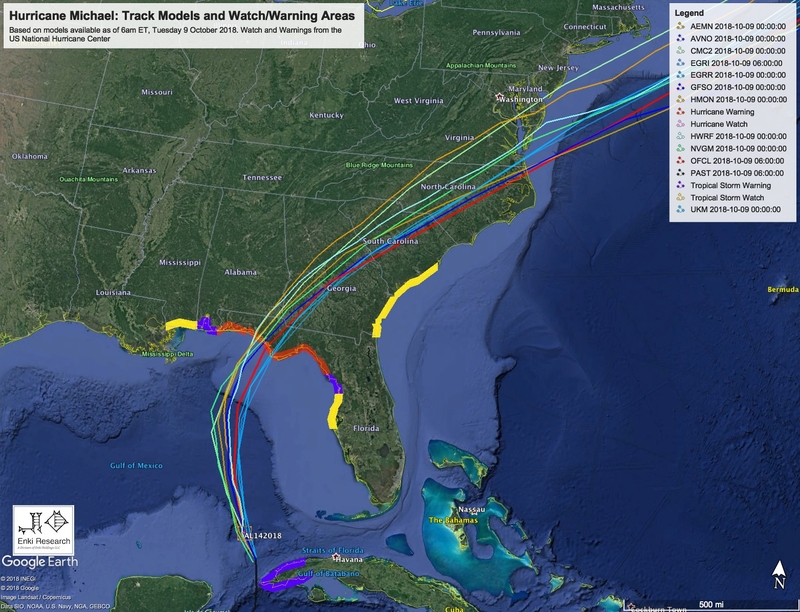 The big dynamic models bring the storm in as a Hurricane, so if you are on the Gulf Coast pay attention. The overall impacts depend a lot on the track – one of those “duh” things meteorologists like to say. The further west, the more likely effects will be confined to the coast near landfall, and the storm will degenerate over land. Further east, especially for a “back door” type storm that makes landfall on the Gulf Coast, exits or skirts the coast of GA/SC/NC, it’s a more widespread problem. Notice how broad the wind field gets after landfall, and the big swath of 40mph+ winds that are offshore. This is typical for a storm that accelerates rapidly after landfall. For those in Georgia and SC, don’t freak out over maps like this that show the storm as a tropical storm well inland. First, as you can see here, the strongest storms will likely be well away form the center, and mostly confined right on the coast. Second, NHC tends to overestimate the inland winds from an impact standpoint. (said in a different way, while it is true there might be a small patch of winds of tropical storm force 24 hours after landfall, it isn’t likely to be as widespread as models and graphics based on their forecast show). That’s fine for planning purposes, but don’t get too upset over it just yet. Again, small changes in this track can produce big changes in impacts, so watch for the official watches and warnings. 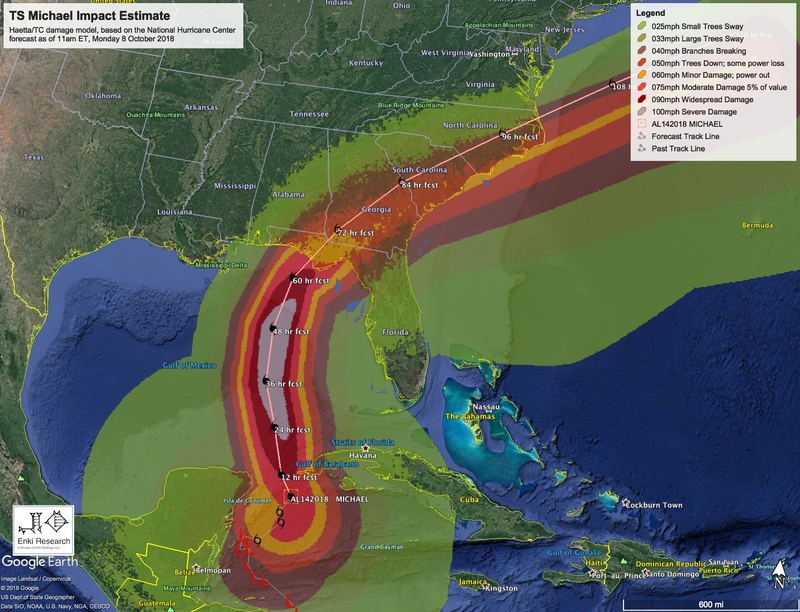 A direct hit on the Panama City area by a Category 1 hurricane could be messy – current impact estimates are around $4.5 Billion, but it’s so early that number isn’t very reliable.